Crush the garlic into the olive oil, and stir for a minute or two. Add the zucchini, and stir so it’s evenly coated with the olive oil, and spread it out evenly in the pan. Let it cook for 8 – 10 minutes until it’s done and starting to brown. Season to taste with salt and pepper and add 1 tablespoon of the minced parsley. When the pasta is done, reserve a bit of the water to use if your pasta seems to dry. (I found I didn’t need it.) 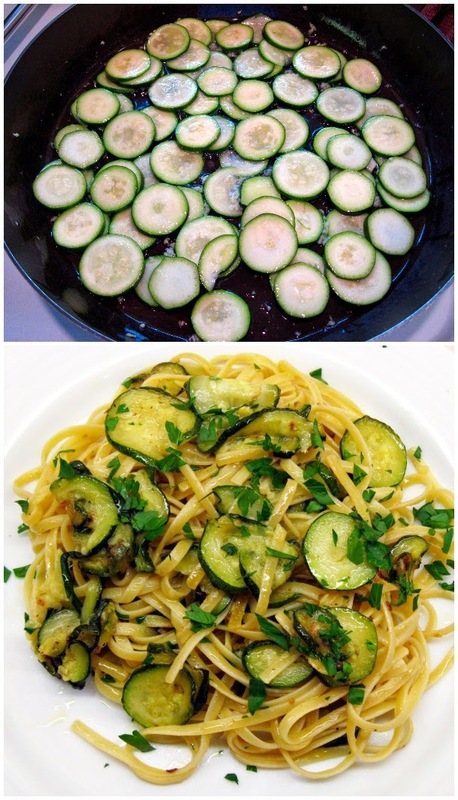 Drain the pasta and add it to the zucchini. Stir it well and cook for about a minute more. Serve, garnished with the other tablespoon of parsley.